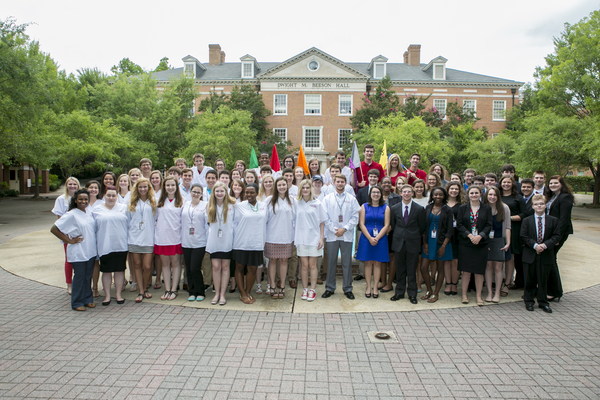 Samford University’s Howard College of Arts and Sciences hosted 57 high school students June 24-27 for M.D. Calling and J.D. Calling, Samford’s residential summer programs for students called to careers in medicine and law. The 35 M.D. Calling participants enjoyed pre-med advising, expert panels of medical professionals and medical students, networking, and a field trip to Children’s of Alabama hospital. Cheyenne Warren of Panama City, Florida, entertained invitations from several similar camps that somehow knew about her longtime desire to become a cardiovascular surgeon. She found M.D. Calling to be the most affordable camp, by far, and was impressed with what it offered—immersion in medical career preparation with smart young people who share her interest. This year’s 22 J.D. Calling participants prepared and presented a mock trial, heard advice about academic preparation and law school application, took part in teamwork activities, toured state and federal courthouses, analyzed legal cases, and learned from panel discussions featuring noted attorneys and current law students. Caroline Saint of Tuscumbia, Alabama, is following in the footsteps of parents Beth and Patrick. She said about five years ago both parents returned to school to earn law degrees. “It really inspired me," Saint said. “It’s never too late to go back and do what you want to do.” Nevertheless, Saint is interested in getting an early start on a law career. She hopes to attend Samford and enter the new 3+3 program that offers both undergraduate and law degrees with less tuition and a quicker professional launch. J.D. Calling helped Saint starting building the connections and professional access she said will be essential in her career. Peers, current undergraduate students, law students, faculty, lawyers and judges are among her new contacts. She also is one of the first people to tour new district court offices in Birmingham. “I would never have gotten that experience,” she said.